Chicago Cutlery have been around since the 1930’s and they certainly know a thing or two about forging kitchen knives. 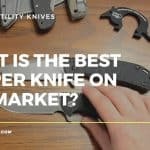 Unfortunately the manufacturing process is carried out in China, meaning the company can’t claim to be fully U.S made, however that hasn’t stopped Chicago from sustaining their reputation of quality crafted cutlery at what are often affordable prices. The Chicago Belmont is a 16-piece block knife set that certainly falls into the affordable category. There is a high degree of quality here with out breaking the bank. What’s Inside The Chicago Belmont 16-Piece Block Knife Set? If you’re a fan of steaks you need look no further. 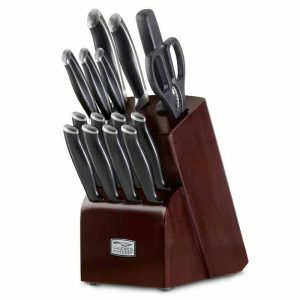 The Belmont Knife Block Set comes with 8 4.5 inch serrated steak knives, ideal for tearing into the red meat when you have guests over. Chicago have also provided the most commonly used knives in the Belmont, making it an excellent purchase for first time block set buyers. Chicago knives are factory sharpened using a unique ‘Taper Edge Grind’ system. In tests run by the manufacturer, this process is said to improve the cutting experience, allowing for ultra sharp knives with greater control. The system also aids sharpness retention and allows for easier re-sharpening. What’s great about Chicago, is that although the Belmont Block comes in at only $50, the manufactures have not skimped on materials. The high-carbon stainless steel blades are strong and resistant to rust, stains and pitting. 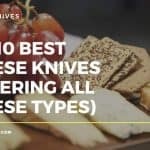 Although we could not test the affects of re-sharpening the knives, previous experience with Chicago knives shows that they restore best with a little manual whetstone sharpening. Having said that, running the blade through one of the many electric sharpeners we review on this site, will also heed great results. Especially if you hone your blades using the sharpening steel that comes included with the set. The set uses (what Chicago describe as a) ‘trend relevant’ espresso wood block, which really does add to the contemporary styling of the piece. Having said that, from an aesthetic standpoint Chicago have always been industry leaders. This applies right across their wide range of cutlery. To top it off, the classically designed polymer handles are non-porous and beautifully polished. This set is definitely one you can show off and have on display as part of your overall kitchen design. 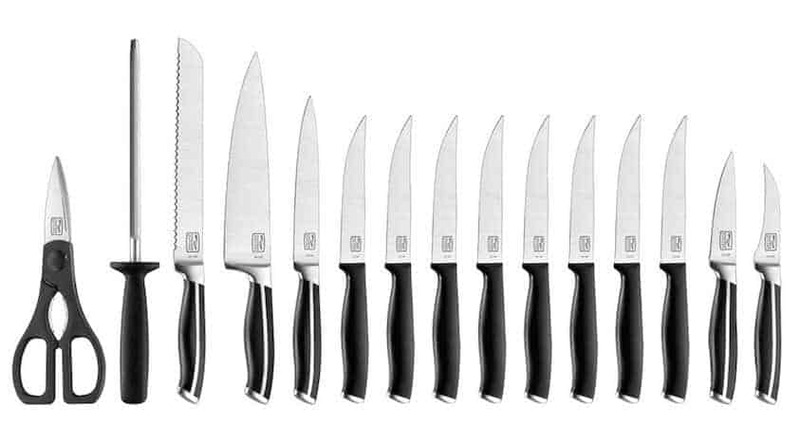 A well designed and constructed 16-peice knife set. The Chicago Belmont is an ideal purchase for anyone who does not yet have a knife block set in their kitchen. This set will have everything you need, especially if you are a meat eater with the 8 included steak knives. Chicago Cutlery began back in1930 in the meat-packing district of Chicago itself. 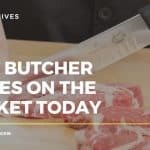 The company started as a knife conditioning service that catered to professional butchers and packing plants in the district. 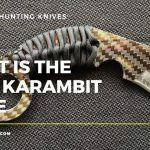 Looking to expand Chicago were quick to seize the opportunity of actually manufacturing knives as well. The company specialized in professional meat and poultry knives as a result of their earlier meat district heritage. By 1969, Chicago Cutlery had entered the retail market providing professional cutlery for both home and industry purposes. Like all good companies that grow and expand over time, Chicago Cutlery was purchased by World Kitchen, LLC. However, the ethos that began with the company back in the 30’s remains today, with the brand continuing to create cutting edge, stylish products for both professional and home use.